I was reminded just yesterday that my book buying habits are not quite normal – but even I balk at a book that costs $45.00 (and that’s the discounted price at Fishpond). I suppose that’s actually quite a reasonable price for a scholarly book and my guess is that students will find the price compares well with other academic texts that they have to buy. 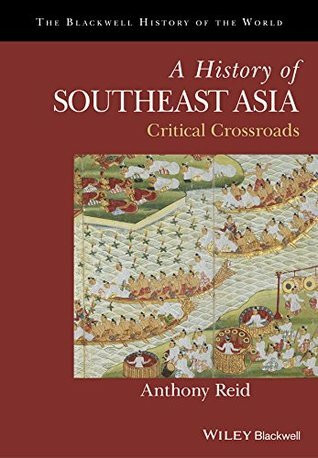 Still, for me, interested in it as a general reader, A History of Southeast Asia: Critical Crossroads is a book that I’d rather borrow than buy because I’m not going to need it as a reference book. I just want to read it and absorb some knowledge new for me. I’m not likely ever to read it again. I discovered the existence of this book from The Asian Review of Books, a site I keep an eye on and where you can learn a lot about Asia just from reading the reviews and occasionally find gems in fiction too. I was a desultory student of Southeast Asian history for one of my degrees and Peter Gordon’s review of History of Southeast Asia: Critical Crossroads was enticing. I wanted the book. I could not countenance paying $45 for it. Solution? My local library. As any other member of Kingston Library can do, I asked them nicely if they would acquire it, and lo! here it is and I get to be first to borrow it! Although it’s a scholarly book (Anthony Reid is Professor Emeritus at the College of Arts and the Pacific at ANU) this history is palatable to read, and there are all kinds of interesting things to learn about our neighbours in this region. And if you’re reading this from Europe, don’t think it’s irrelevant to you! Societies such as the Batak, Bugis, Tagalog, and Shan developed writing, irrigation, metallurgy, and complex religious systems without the benefit of any unified polity. (Preface, p. xix). Southeast Asian women played economic roles equivalent to though different from those of men, and therefore had more latitude and agency than their European, Chinese, Indian or Arab counterparts. They monopolised textile and ceramic production, shared agricultural tasks (dominating planting, harvesting and foraging) and most importantly did most of the marketing and business. The status concerns of Southeast Asian men made them particularly inept in managing money and marketing. European and Chinese male traders dealt largely with local women… (Preface, p. xv111). This post is going to be one of those ‘written-as-I-read-it’ ones (like Voss, Don Quixote and Tale of the Tub) because I want to record what I find interesting as I read it and I don’t want to have to transcribe pages and pages from my journal. So if you are interested in this topic, you need to bookmark this page and come back to it later to see the updates because you won’t get an email notification even if you already subscribe to my blog. (#NoPromises I’ll try to remember to advise about updates on my Twitter feed (@anzlitlovers). While the details may be different, Chapter One covers territory that I’m familiar with from reading Guns, Germs and Steel by Jared Diamond, that is, that there is no inherent superiority in western civilisation, Europe was just lucky that its geography facilitated the spread of (a) useful plants and animals and (b) ideas. (If you haven’t read this book, first published in 1997, then I suggest you add it to your TBR. IMO it’s essential reading.) Until the disruption of colonisation, population growth, trade and the spread of ideas in Southeast Asia has been influenced by volcanic eruptions, typhoons, monsoon winds and its seasonality, but the development of wet-rice agriculture was what enabled surpluses and the development of urban life and culture. In pre-modern Southeast Asia (SEA) this staple rice was supplemented by fish, meat being eaten only on special occasions, and subject to an assortment of religious prohibitions. (For example, when Islam came to SEA, hunting wild pigs in the forest gave way to grasslands created by human intervention – much like Australian Aborigines burning off in the dry season to develop pasturelands. I was interested to see that where there was conflict in pre-colonial SEA, it focussed on capture not killing, because the acquisition of slaves as a labour force complemented the obligations of kinship, debt, [and] inherited status. Indonesian has a fiendish number of personal pronouns to learn and it’s important to get them right because even now these pronouns represent vertical relationships between patronage and duty. This chapter includes a lovely image of one the earliest known bronzes from this region, but there are not many graphics, which is a pity. I’m always fascinated by how discoveries spread. At school I learned in ‘ancient history’ lessons that the Bronze Age began in the Middle East about 3000 BCE, but there are different eras for Bronze Ages in different parts of the world. The earliest evidence of bronze in SEA is in Bali and Palawan in the 3rd and 2nd century BCE and specialist bronze centres didn’t develop until the earliest centuries of the Common Era. On the other hand there is good evidence that Indonesian cloves made it to Mesopotamia in 1700BC, and archaeological, genetic and botanic evidence suggests that Austronesian traders were in contact with the East African coast and operating exchange networks between New Guinea and Fiji 2000 years ago. (p.64) Islamic traders turned up in SEA ports as early as the 8th century, and the Chinese too from the 12 century, long before Portuguese, Spanish and Dutch Europeans ventured across the oceans to develop their trade in spices. It’s just amazing to think of the hazards they faced! From a Eurocentric POV (which is what I grew up with) world history began with the Age of Discovery, i.e. when Europeans set off across the oceans and ‘discovered’ ‘new lands’ – but once again this book challenges that. Reid says that SEA from 1480-1630 was a crucible for the birth of modernity not because of its people (only 10% of world population then, not like now) but because of its location and of course its spices. But it was also because of China’s peculiar trade situation. Because China had closed trade borders, there were only tribute missions from the “barbarian” states to the south and so SEA traders filled the gap, moving goods around where otherwise they might not go. Eventually of course the Chinese gave in to the inevitable and licensed traders, and it was deeply depressing to read about the start of the trade in elephant tusks and rhinoceros horn, a pernicious trade which persists to this day in the service of their so-called traditional medicine, with appalling consequences for endangered species. Reading on, I’ve discovered that commercially successful states had child-rulers (which meant an oligarchy ran the show) or queens – because they were congenial to peaceful commerce. Another little quirk of interest was that because kings were greedy, people accumulated capital in ways that they could hide e.g. gold jewellery. This meant that investment capital didn’t emerge to create capitalist structures (16th century versions of shopping centres and stock exchanges) leaving a vacuum that the Europeans could eventually fill. Well, I guess it was a bit ambitious to think that I was going to get this book finished what with Christmas, New Year, and a trip to Qld to see my father – and I wasn’t expecting a nasty bout of food poisoning contracted while I was up north either – but alas, the book is due back at the library today and I can’t renew it. I got about half way through, enough to reach the period that I know best from my previous studies in Southeast Asian history. The take-home message is that it’s a mistake to assume that it was European colonialism that brought ‘progress’ to SEA: there were fully functioning commercial and social systems, which were in fact disrupted by colonialism though it’s likely that mid C17th local crises including population declines were also triggered by global climate change and local natural disasters in the form of earthquakes, tsunamis and volcanic eruptions. And as the author also says incompetent or tyrannical rulers [brought] ruin on their people as frequently as brilliant ones achieved success. What I liked about this book is its insistence on taking account of ‘the eye of the beholder’. So often we in Australia know too little about our neighbours, and what we do know, we see through a Eurocentric lens. I’d like to think that this book makes its way onto reading lists for our diplomatic service as well our serious journalists, e.g. the ones at the ABC, The Conversation and our crowd-funded news sources such as Inside Story. Or, you could write Pt 2 etc to finally a Final post on it?? Like, Pt 2, Chapters 4-8, etc? I did that for James Joyce’s Ulysses, which I blogged chapter by chapter, but I don’t think one warrants that. And I don’t want to tell all otherwise no one else would buy the book/beg their library for it! I think most people don’t know much about it, and yet with the rise of China the entire Asian region is going to become more important. Australians need to sit up and take notice or we’ll be left behind.